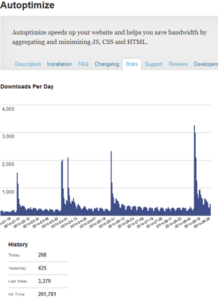 Less then a year after reaching 100000 downloads, Autoptimize broke the 200000 barrier just last week. So yeah, I’m pretty amazed by how well Autoptimize is doing. Thanks for the confidence! This entry was posted in autoptimize, lang:en, performance, wordpress and tagged links, reviews, stats on 30 September 2014 by frank. Thank you again for this great plugin! And you’ll see another comment about it on my website in a few hours (the author link above will be broken until it appears). Great plugin, it does everything what I want and also helped me in speeding up the page loads and minimizes the heavy numbers of requests. Great plugin – I might disable my CDN’s (CloudFlare) minification options now and see how that goes. Going to try it out with Wordfence Falcon, will let you know how I go if you like.